With their newly formed group complete, the Credit Unions of Ontario recently launched a campaign to raise awareness for the way changing ways that Ontarians have towards credit unions and the benefits of this alternative form of banking. The creative campaign is aimed to encourage Ontarians to think about how they bank and consider credit unions as an economically viable and socially meaningful alternative to traditional banking options. 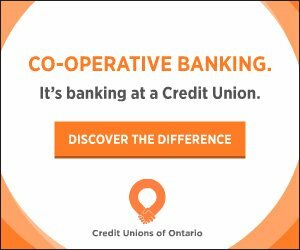 Credit unions from across Ontario have come together as the Credit Unions of Ontario to encourage Ontarians to join the co-operative banking movement, introduced through an inaugural creative campaign. The campaign, which includes ads on television and the web, as well as a refreshed social media presence, is designed to change the perceptions and attitudes Ontarians have towards credit unions, while educating them about the many benefits of this alternative form of banking. The campaign includes television and web ads, as well as a social media presence, as well a survey conducted that reveals that only one in five Ontarians (19 per cent) named a credit union when asked about financial institutions they are aware of. When probed, only one third (36 per cent) of respondents understand the types of services credit unions offer, how they function and how they differ from other financial institutions.